Non expert users need support to access linked data available on the Web. To this aim, keyword-based search is considered an essential feature of database systems. 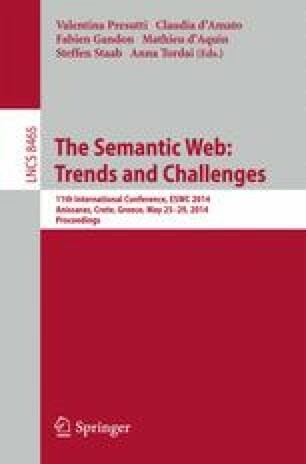 The distributed nature of the Semantic Web demands query processing techniques to evolve towards a scenario where data is scattered on distributed data stores. Existing approaches to keyword search cannot guarantee scalability in a distributed environment, because, at runtime, they are unaware of the location of the relevant data to the query and thus, they cannot optimize join tasks. In this paper, we illustrate a novel distributed approach to keyword search over RDF data that exploits the MapReduce paradigm by switching the problem from graph-parallel to data-parallel processing. Moreover, our framework is able to consider ranking during the building phase to return directly the best (top-k) answers in the first (k) generated results, reducing greatly the overall computational load and complexity. Finally, a comprehensive evaluation demonstrates that our approach exhibits very good efficiency guaranteeing high level of accuracy, especially with respect to state-of-the-art competitors.